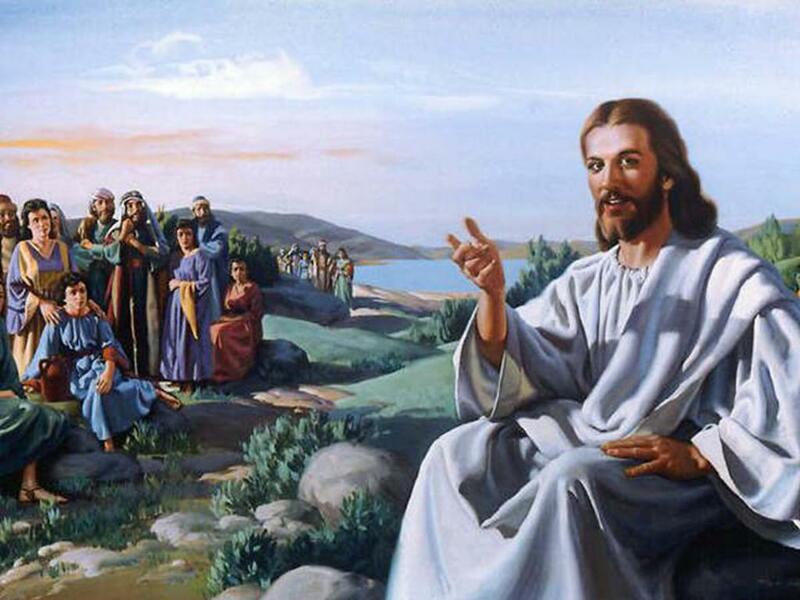 “Jesus said to the Jews: «If I testify on my own behalf, my testimony is not true. But I have testimony greater than John’s. The works that the Father gave me to accomplish, these works that I perform testify on my behalf that the Father has sent me. Moreover, the Father who sent me has testified on my behalf. But you have never heard his voice nor seen his form, and you do not have his word remaining in you, because you do not believe in the one whom he has sent. I do not accept human praise;moreover, I know that you do not have the love of God in you. But if you do not believe his writings, how will you believe my words?” -John 5:31-47. This princess, the greatest glory of her noble family, was the daughter of Theodoric, a powerful Saxon count, and Reinhilde, a princess of Denmark. Her parents placed her very young in the monastery of Erfort, of which her grandmother Maude had become the Abbess. The young girl became in that house an accomplished model of all virtues and domestic arts. She remained there until her parents married her to the virtuous and valiant Henry, son of Otto, Duke of Saxony, in 913. On the death in 919 of the Emperor of Germany, Conrad I, Henry was chosen by his troops to succeed him. Henry was a pious and diligent prince, and very kind to his subjects. By his arms he checked the insolence of invading neighboring armies, and enlarged his dominions by adding to them Bavaria. Saint Mathilda, during those years, gained over the enemies of God spiritual victories yet more worthy of a Christian and far greater in the eyes of heaven. Blessed with five children, whom she raised in the fear of God, she nourished in their souls the precious seeds of devotion and humility through prayer and good works. It was her delight to visit, comfort, and exhort the sick and the afflicted; to serve and instruct the poor, and to afford her charitable assistance to prisoners. Her husband, edified by her example, concurred with her in every pious undertaking which she proposed, and his military victories served for the propagation of the Gospel in pagan lands. The two sovereigns labored concertedly for the reign of justice in all their domains, and for the happiness and welfare of their subjects, constructing hospitals, churches and monasteries. Their three sons became Saint Bruno, Archbishop of Cologne; Otto the Great, who succeeded his father as emperor of Germany; and Henry, Duke of Bavaria. The two daughters married Louis d’Outremer, King of France, and Hugh Capet, first of the Capetian race of French kings. After twenty-three years of marriage God was pleased in the year 936 to call the king to Himself. Before his death, he thanked his worthy companion for having moderated his sometimes too-severe justice, and praised her in the presence of the entire court. Saint Mathilda persevered long in prayer, continuing her good works as before, but could not avoid the difficulties which jealousy of sovereigns almost invariably provokes. She was successfully accused to her own son, Otto, of concealing great riches, and he caused guards to be posted around her, and he led his brother Henry into his own error, to oblige her to leave the court. Without bitterness towards them, she took refuge elsewhere. Eventually Edith, wife of Otto, saw in the mortal illness threatening Henry, a sign of God’s anger provoked by their conduct toward their mother, and recommended the return of Saint Mathilda. Her sons begged her pardon with tears, and afterwards perfect understanding reigned between the mother and sons. Henry died not long afterwards, and his mother thereafter retired almost completely from court life to concern herself with the care of prisoners, the poor and the sick, and the construction of a very large monastery for women at Nordhausen. Eventually she herself entered it, and on March 14, 968, after spending her final years in prayer and penance, she died lying on the floor, having spread ashes upon her head herself. 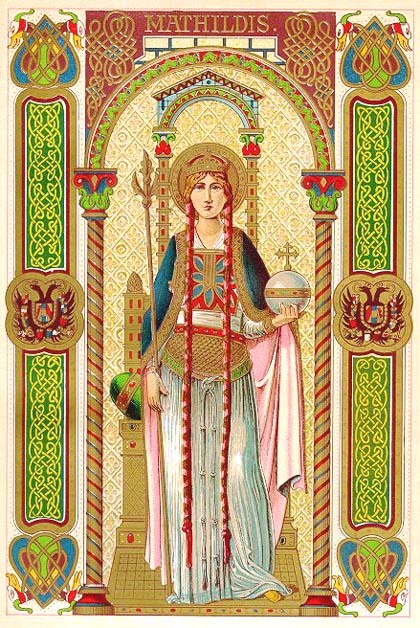 She was venerated as a Saint immediately after her death.